In a blog post released near the end of February, Twitch announced some major changes to how many emotes both Affiliates and Partners can have on their channel. Previously, Affiliates were given one emote for each of the three subscription tiers that Twitch offers. Starting today, Twitch will begin expanding the number of emote slots month-by-month. Depending on the maximum amount of Subscriber Points they have earned, Affiliates can start to unlock up to four more Tier 1 emote slots for a total of seven emotes across all Tiers. While all 5 emote slots aren’t available yet, if an Affiliate has reached 15 or more Subscriber Points now have immediate access to a second Tier 1 emote slot from this point forward. Twitch plans on releasing more Tier 1 slots until May, with the Subscriber Point requirement also increasing until all 5 slots are unlockable. Prior to this announcement, when a streamer would earn Twitch Partnership they would be given a minimum of two emote slots to begin with and have always had the ability to earn more depending on their peak Subscriber Point count. 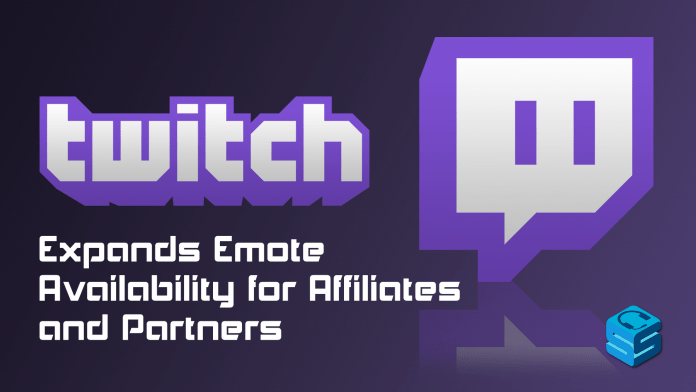 With Affiliates being able to earn up to five Tier 1 emotes, Twitch has also increased the number of emotes Partners can begin with from two emotes to six emotes regardless of their Subscriber Point total. After six emotes, the progression of unlocking further emote slots remains the same as it has been. While Twitch Partners have always had this system of unlocking emotes for quite some time, some Affiliates may be unaware of specific details of the process. The progression charts that lists the number of Subscriber Points required to unlock a new emote slot is based on your peak Subscriber Point total, not your current total. For example, if you are an Affiliate who has earned 25 subscriber points at one point in the past but currently has 10, you would still qualify and have access to the second and third emote slots as they become available. Also keep in mind that the increased flexibility of your total emote slots does not change how you submit them to Twitch, as you must go through the manual approval process and are held to the same standard as your previous emote submissions. Partners who are considered in good standing with Twitch and have not committed a conduct infraction against any of the various Terms of Service (ToS) or Community Guidelines can submit all potential emotes immediately. However, Partners who are not considered to be in good standing due to violating ToS or Community Guidelines must submit their emotes for manual approval throughout the 90-day duration that their account is under review. Have any questions regarding submitting emotes for your channel? You can check out all of the details on Twitch’s Subscriber Emoticon Guide for Partners and Affiliates as well as the full blog post detailing these new changes. Twitch Streamer, host of the Preemptive Strike podcast, and uselessly good at Tetris.